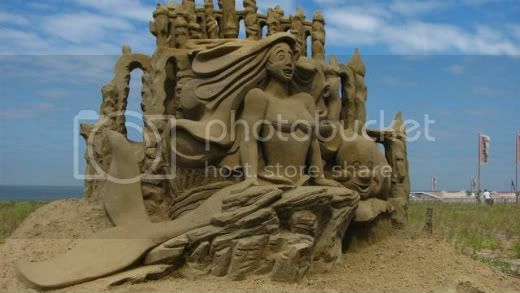 European’s best carvers came together at Noordwijk, Netherlands to create this yearâ€™s sculptures for the European Sand Sculpture 2008 festival held from 18 July to 17 August in Noordwijk. This yearâ€™s theme was ‘In Celebration of Disney’ classic movies like Snow White and Sleeping Beauty got their homage in sand but also the recent Narnia sequel and Pixar’s Wall-E are presented. I traveled to Noordwijk last Wednesday, still quite the journey with tram, train and bus I was underway for about 90 minutes. Pictures are uploaded at my Photobucket account.